How many people can say that they went to the library, learned a wide range of geographical facts, played and had fun while doing so? Probably not too many. However, all of those things can take place in the palm of your hands as you explore Simple Sort: Continents by Kids and Beyond on your iPad device running iOS 5.0 or later. With multiple learning and play modes, Simple Sort: Continents will have your child continent hopping and as Kids and Beyond states giving your child “a whole new global perspective.” With professional narration, detailed and colorful graphics, young learners will be building what we like to call their “knowledge filing system” with animal species, man-made wonders, various landforms, rivers and vegetation of the seven continents of the world. In building this knowledge filing system, users will have the know with all to guide Ms. Clever Cloud. The Clever Cloud family need to do some major fact clean up, but they need your child’s help. As you enter this educational app, flip the page of this virtual encyclopedia in order to get started. Immediately, young learners are presented with a choice: Visit the Library or Play Game. Which direction will your explorer take? Regardless of which direction is taken, users will be supported along the way through voice over explanations and descriptions of each geography fact. However, like any research of new topics, it might be best to begin in the library. The library is broken into seven colorful books, each representing a continent. To enter the library, simply tap a colored book, its continent name will be announced as it opens to the table of contents. On the left side of the page, users will see a map of what that continent looks like. In addition, on the right side of the page, users will have varying amounts of chapters to review, some books have more chapters than others. Chapters can be read in any particular order and can be revisited at anytime. Upon entering a chapter, users will read and listen to quick snippets of information based on that chapter. Whether your child is just learning to read or already knows how, facts can be read to them or by them. Unlike a typical encyclopedia, this virtual book does not present information in an overwhelming manner. With only a few sentences and an image to showcase the new fact, users will be on their way to increasing their knowledge filing system. A note to the developers – might it be possible when an explorer taps the recorded reading that the sentence also highlights the words as it is read. In addition, we wonder if it might be possible to tap on a sentences coordinating image which would then enlarge center screen to provide users a closer look. Whether you are a parent or an educator (in a school or at home), this virtual library provides children a great introduction to those standards being met in the classroom like knowing the five themes of geography as it relates to various regions and being able to describe the diverse nature of our world. Close the book and put your knowledge to the test. Help Ms. Clever Cloud sort out the continent facts into its correct bucket. Upon choosing the “play game” mode, users will have two options, to play and sort with or without a timer. The green button indicates that this will be an untimed exploration. While the yellow clock button indicates that your game will be timed. Simply choose as few as 2 continent buckets or as many as 6. When your child has chosen as many continent buckets as they feel confident in, simply click the green button to begin. Whether you choose to play timed or untimed, developers have included support along the way. At the top of the screen, users will find labeled continent buckets. Underneath will be familiar graphics that users came in contact while visiting the library. Simply drag and drop each; landforms, animals, rivers or vegetation to its correct bucket. Concerned that your child may have forget what something is. Not to worry! Developers have included a recall feature. For this feature to be present, simply use either a single or double tap on a graphic. A single tap will announce what the graphic is, whereas a double tap will announce both its name and fact. For those sorting with a timer, high scores are stored within the application and calculated based on the number of buckets played. Once your child successfully sorts items, players will be presented with a world map and which have red blinking dots on it. These red dots will indicate where in each continent geographic landforms, rivers, animals and vegetation can be found. A nice added touch which helps children to make further academic connections. A note to the developers – we noticed when selecting buckets that one area was missing. Was Antarctica missing due to its limited amount of information provided in the library? In a future update will more information be provided on this location or any other? Overall, Applicable2U was really pleased with Simple Sort: Continents. For those just entering school, it’s a great way to learn and travel the world without leaving the comfort of their home. In addition, it also provides an added reinforcement of social studies skills learned for our older elementary students. To learn more about our friends at Kids and Beyond, please visit their website here. To begin exploring the continents of the world and to help Ms. Clever Cloud sort unknown facts, then begin downloading Simple Sort: Continents to your iPad device for a meer .99¢ today! iVocAudio – Your Memory Chum! Do you want to learn a new language? Interested in creating a study guide to prepare for a test? If you answered yes to either of these two questions, then you will want to download iVocAudio for your iPhone or iPad device. As of today, iVocAudio is a free download, so be sure to take advantage of this amazing offer before it’s too late. It is an application that is customizable for your own learning needs. With built in Quick Start Guides, video tutorials and various viewing options, voice recording flash cards could not be more simple to create. Developers chose to design this application so that it would function in three languages: English, French and Turkish. Integration of iVocAudio is the 21st Century way of reviewing and reinforcing skills. The need to hand write your study notes for educational or personal reasons is now taken out of the equation and your voice becomes the main tool. Whether you are a teacher, student or parent, this application is applicable to you. Through our exploration, Applicable2U can envision iVocAudio fitting nicely within an educational setting as early as late primary to college and beyond. Learning, reviewing or reinforcement occurs with the creation of folders and recordings of pairs. Amazingly, students both young and old can feel independent as they build and experience this mobile learning application. As you begin, a user will want to click the folder tab, simply tap the “+” button and you now have the option to generate a new folder name. Folders are the placeholders that store questions/answers or as iVocAudio likes to call them, pairs. As we tested this educational application, Applicable2U chose to build a folder called United States. Throughout the course of the year, fourth graders are required to know the regions of the United States, state names and their capitals being one component of their social studies curriculum. With this in mind, we chose our first set of pairs to be named: Question – State and Answer – Capital. This is a folder that could be continuously added too and revisited throughout the school year. After creating a folder, recording can now begin. Pairs are added to individual folders in a very visual and intuitive manner. Within the recording tab, users will see a number of visuals. For example, a large “Q” and an “A” are center stage. At the bottom of this window, there appears to be a watch like icon that stores the number of pairs, the REC button and a pair name. When ready, simply click the REC button, the “Q” will be bold as the “A” is transparent. A bolded “Q” or “A” indicates what the user should record. Once recorded, simply click the STOP button. At the completion of recording, users can then begin to “test” themselves. If interested, users can even change how they attempt their test(s). Within the general settings tab, many options can be altered. For example, users can set answers to be announced after 1, 2, 3, 5 and 8 seconds or not automated at all. Also sorting can be manipulated as well has the direction of ones test from Q>A or A>Q. Once these options have been manipulated, users can then click the test button at the bottom of the screen. Testing begins as a user drags and drops the four way directional button to the flashing “Q” or “A”. A user is expected to answer the question on their own and then check their answer. After a comparison is done on your answer users are then expected to drag the directional button to either the green circle indicating a correct answer or the red circle at the bottom indicating an incorrect answer. Concerned about mistakes that students might make while recording, not to worry, iVocAudio has an answer for that. Click the Pair button and users can listen and delete pairs as necessary. When viewing all pairs within a folder, we noticed that users can test themselves at most 5 times. Visually pairs explain whether they have been explored with a question mark or a colored in bubble. If at the end of five testing experiences a user finds that they need more review, they would simply go into the folder tab and hit the reset button. Whether the folder provided a positive or negative experience, the learning can continue until mastery is maintained. In addition, by clicking a pair, users and even parents/teachers can see the number of successes, failures and the maximum number of successes in a row. Academically, reporting in some fashion and being held accountable for ones learning is critical in any good educational application. There are a number of components that iVocAudio has to offer that intrigue Applicable2U. The possibilities that this educational app has to offer is overwhelming. Besides being able to build, record and test yourself on the go, users can even test their own peers. After creating a folder and its coordinating pairs, that folder can be exported and shared with other users via the iVocAudio website, iTunes library or email. Currently, there are a number of other iVocAudio users who have posted their folder(s) for others to use. As more people become familiar with this mode of learning and reviewing this forum of sharing will continuously grow. It is a great way for teachers to support each other across the curriculum. Whether you are learning a new language, reinforcing a part of the social studies or science curriculum, or even spelling out and reading grade level sight words, iVocAudio would definitely come in handy in school and at home. If you would like to learn more about iVocAudio, please visit their website here. Looking to do a little review on the go, then you will want to begin downloading iVocAudio to your iTunes library here. Recently, educational travel apps are slowly becoming more popular to find in the Apple Store and today’s review will let your 4-9 year old travel the wonders of Africa. With a Dora the Explorer or Diego feel, twisted with a little Blue’s Clues, this adventure series educational app will truly stimulate all senses. Seamlessly, this educational app incorporates a variety of curricular areas in a textbook like app for children. While on this virtual field trip, children will be developing their language and vocabulary, critical thinking and higher order skills. 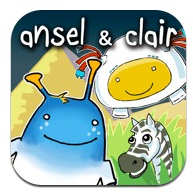 Cognitive Kid has recently launched Ansel & Clair’s Adventures in Africa. With original music and two very adorable characters, Ansel, the intergalactic travel photographer and Clair, Ansel’s brilliant side kick who happens to be a robot. Both friends are from the planet Virtoos and with the help of their spaceship, Marley Peterson, they will explore the continent of Africa. As Ansel and Clair were traveling the world, Marley, their spaceship broke into many pieces over the continent of Africa. One of your missions is to locate the missing pieces as you explore three regions in Africa: Nile Valley, Sahara Desert and the Serengeti Plains. Along the way, will never need to question what something is or its role. Cognitive Kids has incorporated a wonderful page-by-page help guide as well as auditory explanations from Ansel. This African simulation can store up to 4 players as it remembers your achievements along the way. Amazingly illustrated with life like art, or 3D images, users won’t even realize that learning is actually happening. Our motto that we try to abide by,”Gaming for a Reason“, is certainly met with the integration of this app on our iPad device. Applicable2U was amazed at the vocabulary development that this application provides. In order to find Marley’s missing pieces, users will become familiar with the oceans and rivers surrounding Africa, visit a number of monuments and landmarks as they grasp the various animals and plant life found in Africa. Navigation within each region is guided by “tracker” buttons. Tracker buttons are either active, not yet completed or completed interactions with objects from that region. Through differentiated instruction, users will listen to Ansel and Clair explain each finding. However, if at anytime, a user(s) requires additional support, simply press the light bulb attached to the tracker and Clairvision will offer a deeper understanding with pictorial hyperlinks, dialog and text. All explorers have a backpack, inside Ansel’s is a camera and travel log. Users will collect 29 gorgeous images of animals, landmarks, and bodies of water. Each stored and arranged in a journal for future viewing. We were pleasantly surprised to find added games and puzzles that integrate math and science which keeps to the theme of Africa as we explored the various regions. Who knew that in one simple download that my student(s) or child could travel the world, learn to tell time, and develop a wide range of science and social studies skills. The integration of mobile learning to any home or school setting is truly effective! Cognitive Kids has certainly hit home with this travel educational series. As an educator, Ansel & Clair’s Adventure’s in Africa can most certainly fit into an elementary setting as it meets the academic standards of both Social Studies and Science. Overwhelmingly, Applicable2u can see this is an application that could appropriately fit into a whole, small or individual group setting. Ansel & Clair’s Adventures in Africa provide opportunities for extended discussions, questions and a true understanding of key vocabulary. With the integration of such technology, various learning styles are met and content is understood, not just covered. Learning can happen in a variety ways. Simply connect your iPad device to a large screen and open the opportunities for a scavenger hunt or webquest like activity where children can discuss content and respond to questions via paper or even a documentation app on your device. As continents are learned, use this app for research purposes rather than having students freely out on the Internet as it supplements those hardcover books from the library. Interested in developing science and social studies curriculum at the same time, create a “Find the Definition Of” interactive game as you incorporate an interactive whiteboard to your lesson or unit. The possibilities are endless which explains why this is gaming for a reason!!! Applicable2U would definitely recommend downloading this educational app. Currently it is being offered at a discounted price, so get it while you can! We are encouraged to see that this app is one of a series and we look forward to future apps added to the iTunes library. To learn more about Cognitive Kids, Inc., please visit their website here. Or you can begin on your African adventure today, by clicking here. With the large screen of an iPad which is then connected to a desktop computer, history classrooms will transition. From learning through a boring lecture of information to a visual representation as it flowed over time. Upon entering Wonders of the Old, a user will see all time periods and events associated with a particular location. If you happen to be studying one region not to worry. Simply pinch and zoom to a specific period in time. By clicking the images, time periods, informational bubbles and regions, users are then navigated to a browser like window. With the support of Wikipedia, users can be certain that resources are valid and will further enhance and/or reinforce the curriculum. Wonders of the Old Ancient Timeline can be used in both a whole and small group environment. It can be implemented throughout various parts of a unit or lesson. In addition, it can also be used as another form of research for students when writing reports, and sharing or presenting information. From our experience thus far in the Apple store, this is the first in depth research like app that we have come across. Just as technology is changing so is the way that we do research. Knowledge whether new or old, is truly in the palm of your hands, just in the format of an application. Another positive that Applicable2U sees in Wonders of the Old Ancient Timeline is that it provides the necessary information for building a bibliography or works sited page. What can Wonders of the Old Ancient Timeline do for you? With the implementation of the social studies curriculum across many grade levels, the incorporation of technology, and the development of library skills, the collaboration between these developers is a definite home run! 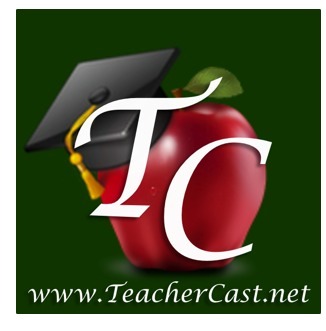 If you would like to learn more about iHome Educators or Knowledge Quest be sure to click the developers links. 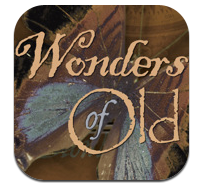 Or you can you begin downloading Wonders of the Old Ancient Timeline by clicking here from your iTunes library. Are you a teacher that is required to teach about National Parks of the United States? Or are you just a travel buff that loves to see the magnificent places that the United States has to offer. If you answered yes to either of these two questions, then you too will want to download Fotopedia National Parks for your iPhone or iPad today. It’s currently FREE for a short period of time, as it is normally $4.99. Lets begin our exploration of 58 National Parks of the United States from Acadia to Zion National Park. As an educator that interacts with students that are required to observe and describe national historic sites and parks this application will certainly fit in nicely during that unit of study. I would equate this application as a travel brochure of stunning pictures and an encyclopedia on the go. 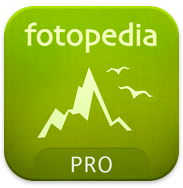 While in the classroom that has WiFi connection, I envision a teacher using Fotopedia throughout the social studies unit. Whether your classroom has iPads or iTouches, this can be both a teacher and student used application. To start off your National Parks unit with a few “oohs and ahhs”, connect your iPad to a projector with the help of a VGA adapter. As a group navigate through a few of the parks and model how the application is used. With a shake of the iPad, a random park is chosen. Lets begin our journey by visiting Arches National Park. As a group students can click on the information button and be linked to Author Comments, printing capabilities of photographs, basic encyclopedia information, and a link to the U.S. National Park Services site along with Fotopedia. Planning to visit or just need to do some research, click on the magnifying class and this will provide you additional sights of interest while exploring. If you happen to see something that sparks your interest, click the star button and it will be saved to your “Favorites” folder for future viewing. Want to map out your trip or just see where it is located within the United States, then be sure to click on the globe button that links you to a Google Earth feature. Can’t get into the computer lab, but have access to either iPads or iTouches, then have students work independently at their desks with the Fotopedia app. With a note-taking sheet and WiFi connection, students will have everything that they could need in order to begin their research of one of the 58 National Parks. Students can feel as though they are taking a virtual trip to those places that they are being asked to explore and then share with the group through some performance assessment. The offer that Fotopedia is currently providing is definitely not one that any educator, travel guru or photographer wants to miss out on. Applicable2U thinks this is a MUST HAVE app and looks forward to downloading additional apps by them. If you would like to read more about Fotopedia National Parks then you will want to visit Fotonauts, Inc’s website here. The United States has a number of beautiful landmarks, lets celebrate them by connecting to your iTunes library here for more apps by Fotonauts.